Divine aadi month starts from mid days of July and lasts till mid-August.Majority of days during this aadi month are special and moreover its a dedicated holy month for worshiping god and goddesses.All through this month limitless amount of aadi koozh (kind of summer-drink) are made and served to people,most of the amman(goddess) temples here in Tamil Nadu serve this spectacular cooling-healing summer drink. For tasty Ragi/Aadi koozh the millet powder should be soaked for at least 6-8 hours and should be carefully stirred without any lumps while cooking.It should be cooked till ragi becomes shiny thick and even the colour becomes deeply intense after cooking.Millets are usually filling by itself so if you take it as a thicker porridge form then you will not be hungry for a while but in temples they serve as thin koozh mixed with onion bits,chillies and some times even raw mango pieces are added.Ragi koozh is a definite wholesome and self satisfying drink to have in summer. Usually cooked broken rice called noi arisi is added to it here I have added samai arisi(little millet) instead,which is equally good.After making,cool the mixture and store for later use in the fridge before mixing it with buttermilk and this will keep well in fridge up to a week. 1.Soak ragi flour in 2 cups of water overnight or 6-8 hours(mix and keep). 2.Morning first boil samai rice in 11/2 cups(roughly)of water till its nicely cooked. 3.More water will be there with cooked rice its okay. 4.Mix overnight soaked ragi flour with the samai rice mixture and keep ready. 5.Now in a thick bottomed vessel add 2 cups of water,bring to boil. 6.When it boils bring down the flame add the mixture slowly without formation of lumps you should stir continuously add necessary salt also to it. 7.Now after sometime you can bring back the flame to high mode and keep on stirring till it forms a thick shiny mixture. 8.It may take at-least 15-20 minutes to be nicely cooked. 9.You can switch off the flame. 10.Now transfer to a large broad vessel to cool. 11.When you touch with your wet hands it will not stick,this way we can recheck that the mixture is cooked. 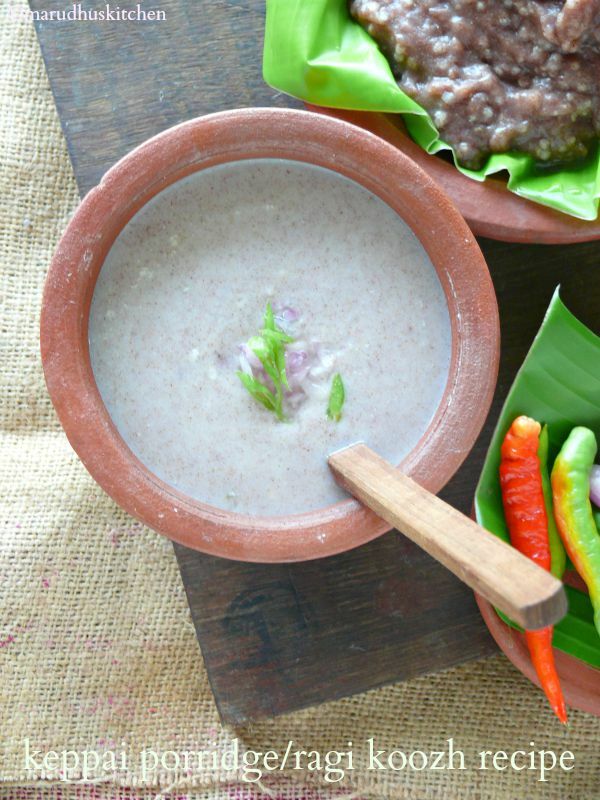 12.After it cools take some two scoops of ragi koozh add needed buttermilk,some-onions and chillies,mix and enjoy(always check for salt and if needed add). 13.It can be diluted to whatever consistency you want may be thick or thin I love to have it thin. Soak ragi flour in 2 cups of water overnight or 6-8 hours(mix and keep). First boil samai rice in 11/2 cups(roughly)of water till its nicely cooked. More water will be there with cooked rice its okay. Mix overnight soaked ragi flour with the samai rice mixture and keep ready. Now in a take thick bottomed vessel add 2 cups of water,bring to boil. When it boils bring down the flame add the mixture slowly without formation of lumps you should stir continuously and add necessary salt. Now after sometime you can bring back the flame to high mode and keep on stirring till it forms a thick shiny mixture. It may take at-least 15-20 minutes to be nicely cooked. You can switch off the flame. Now transfer to a large broad vessel to cool. When you touch with your wet hands it will not stick,this way we can recheck that the mixture is cooked. After it cool take some two scoops of ragi koozh add needed buttermilk,some-onions and chillies mix and enjoy(always check for salt and if needed add). It can be diluted to whatever consistency you want may be thick or thin I love to have it thin. You have to be definitely be near the stove always stirring the mixture otherwise it easily forms lumps. I have used samai rice for this usually rice noi/broken or even boiled rice is used. Buttermilk that is to be mixed can be watery no worry it will be more tasty. 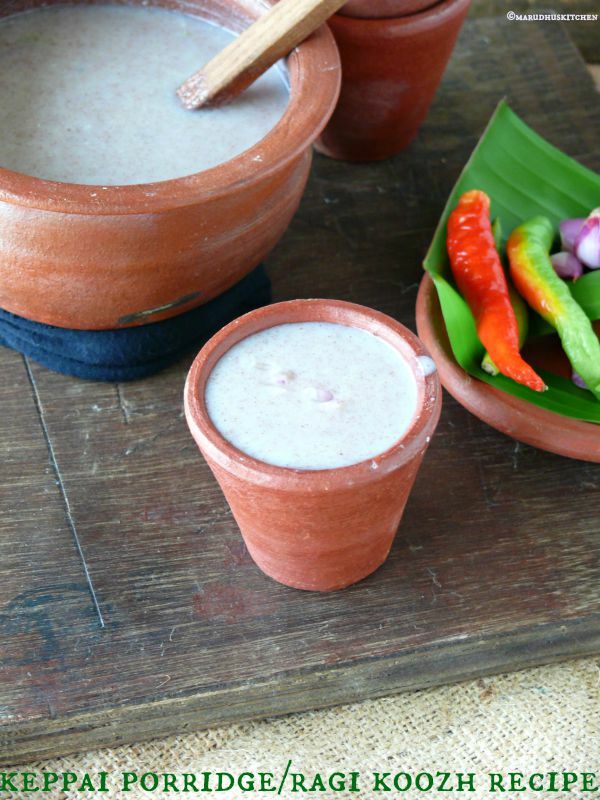 Soaking ragi is the usual method done here and it tastes very good. I have added small onions and chilli for spiciness and crunch. If you want to avoid chillies can leave and it can be accompanied with spicy pickle or even spicy curry/kulambu. Use heavy bottomed vessel and cool the mixture before mixing with buttermilk. 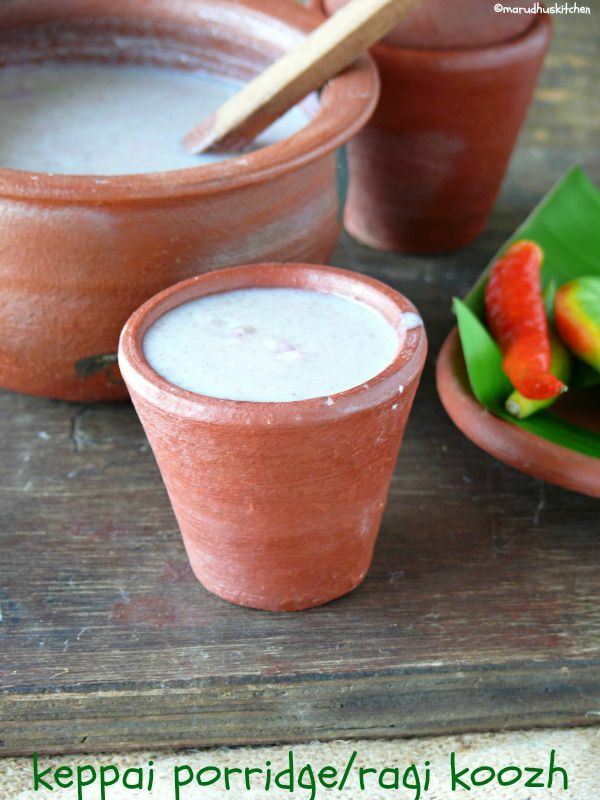 You can refrigerate this ragi koozh without butter milk for more than a week and u can take out when needed mix with buttermilk and use.